Premature babies need extra oxygen and mechanical intervention to breathe but this can damage their lungs, causing a chronic lung disease. A stem cell treatment soon to be tested in clinical trials at The Ottawa Hospital may help heal the lungs of premature babies. Little Olivia Eberts had oxygen tubes in her nose until after her first birthday. Because she was born prematurely her tiny lungs were underdeveloped and she couldn’t breathe without oxygen. Ironically for Olivia, and many premature babies like her, the oxygen that saved her life also damaged her lungs, causing bronchopulmonary dysplasia (BPD), which is like starting out life with emphysema. This meant she needed to stay on oxygen even longer to help her breathe. “She was on supplemental oxygen for so long, it was almost part of her identity,” said Jamie Eberts, Olivia’s mother. Olivia was born on January 29, 2017, at 23 and a half weeks gestation―or 17 weeks too early. She weighed one pound, two ounces. Her twin brother Liam weighed only a few ounces more than her. 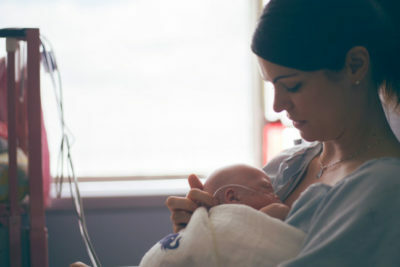 Both babies required oxygen and mechanical ventilation to keep them alive and as a result both developed BPD—the most common cause of death in premature babies. Sadly, baby Liam passed away a few weeks after he was born while Olivia remained in the Neonatal Intensive Care Unit (NICU) at The Ottawa Hospital for seven months. In Canada, 1,000 babies suffer from BPD every year. Often babies with BPD, develop other chronic lung diseases, such as asthma, and many require prolonged oxygen and ventilation. They also have a high incidence of hospital readmissions in the first two years of life. Babies with BPD often have problems in other organs as well, such as the brain or the eyes. When Olivia was finally discharged, she went home with an oxygen tank. During the first year of her life, Olivia spent more time in hospital than out. “Currently there is no treatment for this disease,” said Dr. Bernard Thébaud, a neonatologist and senior scientist at The Ottawa Hospital. He hopes to change the outcome for babies, like Olivia, who have BPD. 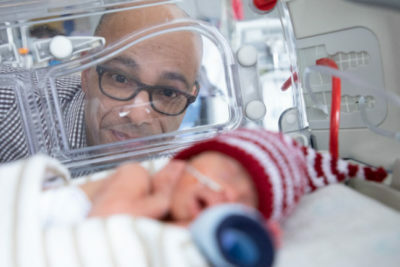 Dr. Bernard Thébaud looks at a premature baby in an isolette. Dr. Thébaud and his research team are preparing for an early phase clinical trial to test the feasibility and safety of the stem cell treatment on premature babies. “We are the only ones doing this kind of stem cell research in Canada, and there are only a few other teams in the world that are doing this,” said Dr. Thébaud. Two years ago, when Olivia was in the NICU, Jamie and her husband Tim met Dr. Thébaud and wished his stem cell treatment could have been available to help heal their babies. Olivia is now a happy, active toddler who loves copying what her older brother Jacob does. Although, she still has BPD, it is increasingly manageable, and she no longer requires supplemental oxygen. Olivia may suffer respiratory illness her entire life but one day, a stem cell treatment developed here in Ottawa could mean that the next generation of babies with BPD won’t.